“How to cook pumpkin?” you ask. If you have ever tried to make pumpkin pie out of last week’s jack-o-lantern, then you have already discovered that roasted and pureed pumpkin is not the same as the canned pumpkin you grab at the market. Remove the seeds and stringy pith from the pumpkin. Cut it into manageable pieces for roasting. Preheat the oven to 425 degrees and oil a baking sheet with a high heat oil of choice (we use avocado oil). Oil the cut sides of the pumpkin and arrange on the baking sheet. Roast the pumpkin until it is soft. A sharp knife should slide into the pumpkin pieces with no resistance. Obviously, the time on this will depend on the size of your pumpkin pieces and on the variety of the pumpkin. When the roasted pumpkin is cool enough to handle, scoop the pumpkin flesh into the bowl of a food processor and puree until it is smooth. You may have to do this in several batches. Scoop the pumpkin puree into a large colander placed in a large bowl or some container for catching the drips. Keep the puree draining for at least a few hours (overnight preferably), stirring occasionally. The puree will thicken considerably. 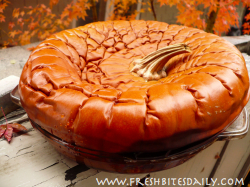 To avoid all the draining trouble described above, start with a pie pumpkin, also called sugar pumpkins. These darlings are considerably smaller than the showy big ones that sit on doorsteps in the fall. The meat of the pumpkin is dry, dense, and higher in sugar. This is what you really want to make into a pie! To replace a recipe calling for canned pumpkin with pumpkin puree from a fresh sugar pumpkin, place the puree in a colander and allow it to drip for about thirty minutes. You can also use any winter squash, often with even better flavor. Pumpkin and winter squash are in the same family, tightly knit cousins. In some cultures where these vegetables have been mainstays, you will find winter squash being used where the label on the final product is “pumpkin.” Pumpkin empanadas are a good example of this. Take a bite out of one of these Mexican pastries and you will swear it is pumpkin. In all likelihood it is from a Hubbard squash: dark yellow, dense flesh, very sweet…a perfect “pumpkin” puree. 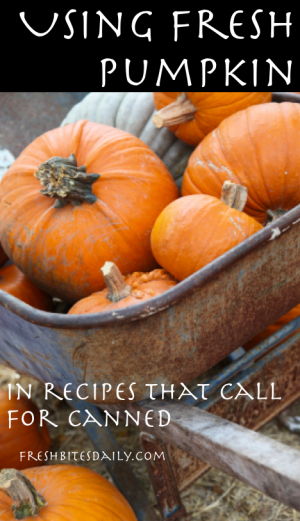 3 Comments on "How to Cook Pumpkin for Pie (Even Your Jack-O-Lantern)"
Lee — Awesome! I’m going to try it. Thanks for these suggestions. I actually have a lot of pumpkins here from the Halloween party. I should say it is really more delicious if the purees are homemade rather than those canned in groceries.